I am pleased that, for once, I am posting within 24 hours of your uploading - as opposed to my usual year, two year or (as in this previous instance) five year delay! It was great to hear your take on the evolution of co-op in the five years since your original posting. I am very pleased (as well as relieved!) that you too enjoy the L4D series and what it has done with regards to co-op gaming. As a dedicated co-op gamer, I truly hope more games in that vein continue to be made (come on L4D3!). In my original comment, I mentioned Gears of War Judgment being a good example of what you appear to have been hoping for five years ago. I still stand by that (the fact that it has four playable characters, each with their own part of the story to tell), but I thought I’d add that since my original comment, my husband and I have explored more of the multiplayer and I think it is another step in the right direction in terms of co-op gaming. I am not sure if either of you have looked into it at all, but with their survival mode you can be one of four different characters, each with a different ability (one repairs fortifications, one provides ammo, one heals and one supplies intel, allowing you to see through walls) and each with a different load-out (I believe this is more in line with Team Fortress). Much like with L4D, if you do not work together, you will fail and fail miserably! To put this in perspective, we have played survival numerous times now and have only survived all ten waves, once! It’s good fun though and I really appreciate a game where you are forced to work together and are rewarded for it. It encourages you to recruit your A-team, communicate effectively and work together co-operatively. If you haven’t had a chance, do give it a go, as it is certainly something moving in the right direction. Anyway, always longer than I intended, but thank you again for the thoughtful response to my comment and keep up the good work! Speaking of co-op games, have you guys seen or tried playing Artemis? It's essentially an unofficial Star Trek Bridge Simulator that turns six computers into the various consoles around the bridge. Because each player has control over a different aspect of the ship, you then have to work together to pilot around space and defeat various alien invaders. It's pretty good fun if you can get 5 or 6 laptops or ipads in someone's front room. One game that could be interesting in regards to coop is "Divinity: Original Sin" that just finished its kickstarter: You can choose different answers in dialog. Whetheryou win an argument is dependant on your stats and the dialog option you chose, so you could play a game with two characters who disagree a lot about how to solve a problem. Thanks again Katie! 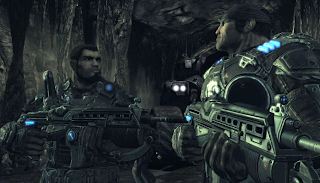 I haven't played the newest Gears yet, but I do remember the horde mode from 3 being similar in that you are both building/crafting and fighting at the same time. I liked this a lot since if everyone on your team went all Rambo, there would be no one to fortify your position, leading to a swift death. Interesting! I hadn't been following this, but I'm eager to see how this plays out and what avenues people have to resolve their differences, especially when they have different skill sets.